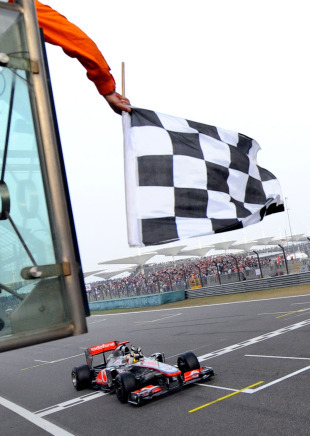 Lewis Hamilton took a brilliant victory in the Chinese Grand Prix, passing Sebastian Vettel within the final five laps to win an engrossing race in Shanghai. Vettel was second just ahead of his team-mate Mark Webber, who put in an exceptional performance to take third after starting 18th on the grid. Jenson Button lost out to Webber on the penultimate lap, with Nico Rosberg fifth and Felipe Massa sixth. The race was set up off the line, as Button got ahead of the slow starting Vettel, while Hamilton also forced his way up the inside in to turn one. Vettel had to defend from Rosberg, and just managed to hold him off through the first few corners. Michael Schumacher made a good start up to ninth, behind the Force India pair. Rosberg pitted first from fourth place, before Button and Vettel pitted on the same lap. Button oddly stopped in the Red Bull pit area first, and then had to pull forward in to his own, costing him the place. Hamilton then slipped back in to the clutches of the Ferrari's and lost out to Massa, while Schumacher got ahead of Fernando Alonso for 6th. When it all settled down, Rosberg led by over five seconds from Vettel as he made the most of the undercut of new rubber. The race never really settled down, as Rosberg held position before pitting once more, as did Button and Hamilton, leaving Vettel in the lead on a two stop strategy with Massa in close company. When Vettel and Massa pitted, they returned close together behind Rosberg and the two McLarens. Hamilton was quicker than his team-mate on the soft tyres, and managed to get past by diving up the inside in to turn one. There was close racing all down the field, as Webber and Schumacher battled for sixth place, ahead of Alonso who had trouble with his DRS, which at one point opened in the wrong place. Once all of the pit stops had taken place, Vettel led Massa, with Rosberg, Hamilton and Button all within eight seconds of the lead. Rosberg was warned that his fuel level was critical, and Hamilton managed to get past him under braking in to turn six. Hamilton quickly reeled in Massa, and got ahead on the exit of the last corner before setting off in pursuit of Vettel. As the championship leader struggled on worn tyres, Hamilton took his time before easing up the inside in to turn seven to take the lead. Button was unable to make any impression on Vettel however, and was soon under pressure from Webber who was displaying pace over two seconds quicker than anyone else. On soft tyres he passed the McLaren in to the penultimate corner, and eventually finished only 7.5 seconds behind the race winner. Further back, Sergio Perez was having another strong race as he made moves on Sebastian Buemi and Rubens Barrichello, but his enthusiasm got the better of him as he had a coming together with Nick Heidfeld which earned him a drive-through penalty, and then later drove Adrian Sutil off the track in to turn one. Paul di Resta had made a good start up to seventh place but complained of trouble with the rear of his car, and eventually slipped back to 11th behind Kamui Kobayashi. Jaime Alguersuari was the only retirement from the race, his right rear wheel coming off immediately after a pit stop. It was a better day for Lotus though, as Heikki Kovalainen beat Pastor Maldonado's Williams to 16th on outright pace, while HRT also recorded its first double finish of the season. Michael Ruane has lived most of his life in poker obscurity, exactly how he wanted it. But those days are gone now that he's in the November Nine. Two-time World Series of Poker bracelet-winner Cliff Josephy is the chip leader of the 2016 WSOP main event, which reached its final table Monday. Vojtech Ruzicka leads with 27 players left in the 2016 WSOP main event, with 50-year-old and two-time bracelet-winner Cliff Josephy just behind him. Players near the bottom of the chip counts on Day 6 of the WSOP main event have a paradox -- they're still in, but their chances of advancing are slim. Jerry Wong is one of three players with at least 10 million chips going into Day 6 of the 2016 WSOP main event, but it's a tight race up top. The Blues have the talent and an excellent coach in Tana Umaga, but they'll need strong leadership if they're to succeed in Super Rugby -- Craig Dowd writes. Clear outsiders before naming their squad, the Jaguares sat at $251 to take the title; but with the naming of 23 Pumas stars in their squad, they are now one of the most favoured teams. Super Rugby enters its 21st season this week, but there is no reason to party as expansion has made the competition woefully lopsided, Greg Growden writes. Eddie Jones is set to shake up England, but how did an Aussie youngster who grew up loving cricket morph into the hardened leader the rugby world knows today? 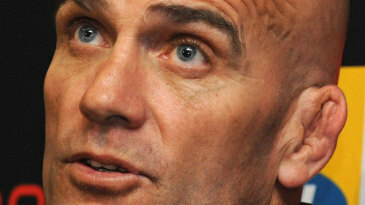 We take a look back through John Mitchell's coaching career, beginning with that stint in charge of the All Blacks. London Irish strengthened their grip at the top of the Aviva Premiership table with a 40-24 victory over Leeds Carnegie.